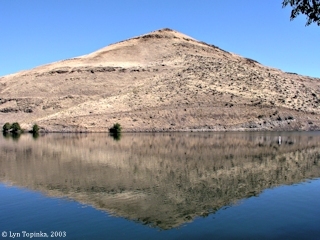 Click image to enlarge John Day River, Oregon, looking upstream. John Day River, looking upstream, as seen from LaPage Park, Oregon. Image taken September 26, 2003. The John Day River is the second longest free-flowing river in the continental United States after the Yellowstone River. Its drainage area covers nearly 8,100 square miles and is the 4th largest subbasin in Oregon. The river flows northwest from the Blue Mountains and joins the Columbia River at River Mile (RM) 218. Two miles downstream is the John Day Dam and four miles downstream is the Oregon community of Rufus. The John Day River was named for John Day, a member of William Price Hunt's Astoria overland expedition of 1811 and 1812 (near Astoria is a second John Day River, also named after John Day.). Lewis and Clark passed the John Day River on October 21, 1805, and Captain Clark mentioned it in his journal. The Captains named this river "River La Page" after one of their members, Jean Baptiste Lepage. 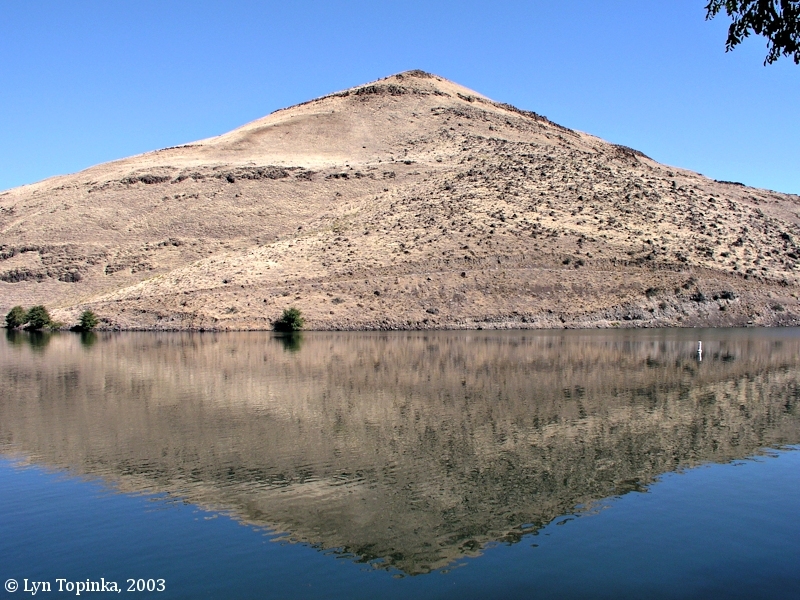 Their campsite that night was located on the Washington side of the Columbia just below today's John Day Dam. 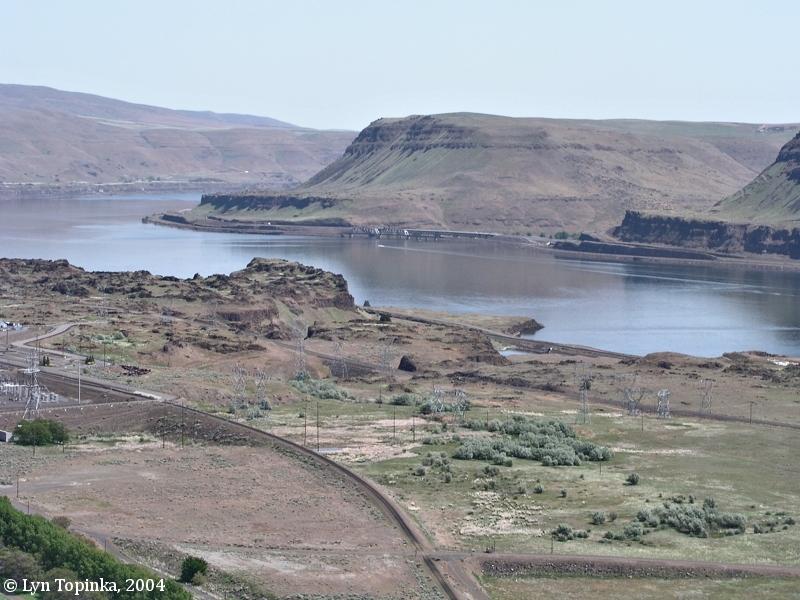 On April 22, 1806 on their return upstream, the men camped again on the Washington side of the Columbia, this time upstream of the John Day Dam and across from the John Day River. According to their route map [Moulton, vol.1, map#77], the campsite was located almost directly across but yet a bit downstream of the John Day's mouth. In their journal entries for April 22, 1806 however they make no mention of the John Day River. According to the Columbia Basin Fish and Wildlife Authority website (2004), the John Day system contains over 500 river miles. Three major rivers flow into the mainstem John Day -- the North Fork, Middle Fork, and South Fork John Day rivers. The largest of these is the North Fork John Day, which originates in the Wallowa-Whitman National Forest in the Blue Mountains at elevations near 8,000 feet, flows westerly for 117 miles and joins the mainstem John Day near Kimberly, Oregon. Many segments of the John Day River have been designated under the federal Wild Scenic Rivers Act and Oregon's State Scenic Waterways Act. 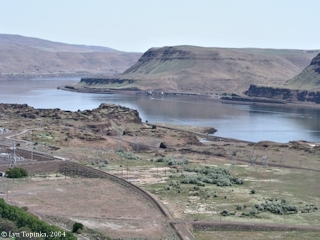 Click image to enlarge Lake Umatilla, the reservoir behind the John Day Dam, looking towards the mouth of the John Day River. View from Washington State Highway 14. Image taken April 24, 2004. "... The JOHN DAY RIVER, ..., called LePage's River by Lewis and Clark for a member of their party, honors a member of the Astorians. Washington Irving describes John Day as "a hunter from the backwoods of Virginia.... about forty years of age, six feet two inches high, straight as an Indian; with an elastic step as if he trod on springs, and a handsome, open, manly countenance. He was strong of hand, bold of heart, a prime woodsman, and an almost unerring shot." Day, with Crooks and several French Canadians, fell behind on the Snake River, while Hunt forged ahead with the main party in the winter of 1811-12. The following spring when, after many hardships, the two Americans reached the mouth of the John Day River "they met with some of the 'chivalry' of that noted pass, who received them in a friendly way, and set food before them; but, while they were satisfying their hunger, perfidiously seized their rifles. They then stripped them naked and drove them off, refusing the entreaties of Mr. Crooks for a flint and steel of which they had robbed him; and threatening his life if he did not instantly depart." In this forlorn plight they were found months later by a searching party and taken to Astoria. Day decided to return to the States with Robert Stuart's party, but before reaching the Willamette he became violently insane and was sent back to Astoria where he died within the year. ..."
Click image to enlarge John Day River, Oregon, looking towards mouth. John Day River, looking downstream towards its confluence with the Columbia River, as seen from LaPage Park, Oregon. Image taken September 26, 2003. 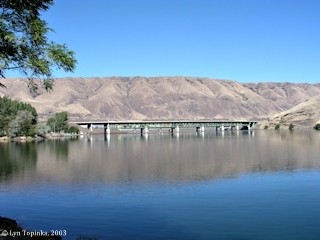 Click image to enlarge John Day River, Oregon, right bank, at mouth. John Day River, looking across towards the right bank at the northwestern part of "The Nook", as seen from LaPage Park, Oregon. Image taken September 26, 2003. 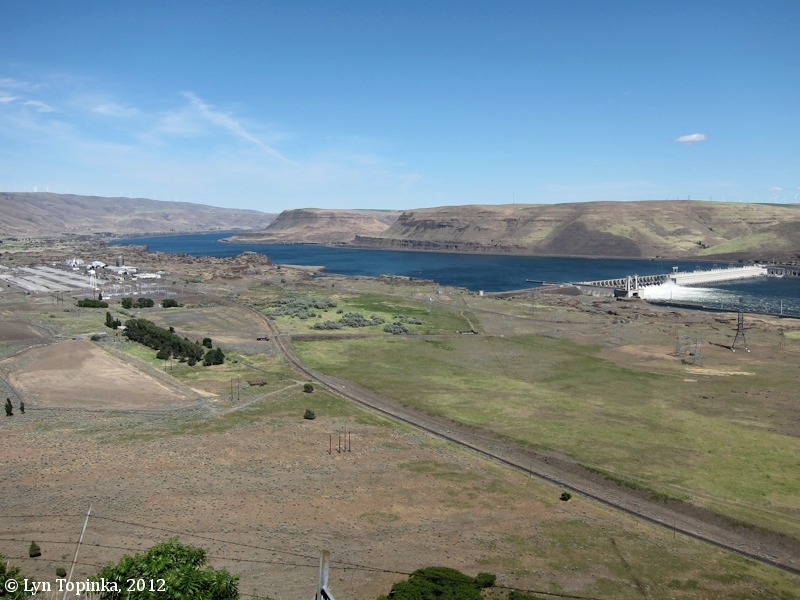 Two miles downstream of the John Day River is the John Day Dam. 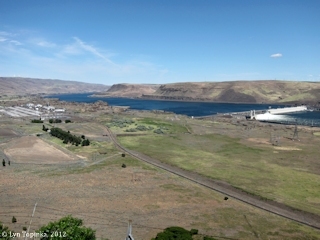 Click image to enlarge Columbia River as seen from upstream of John Day Dam. 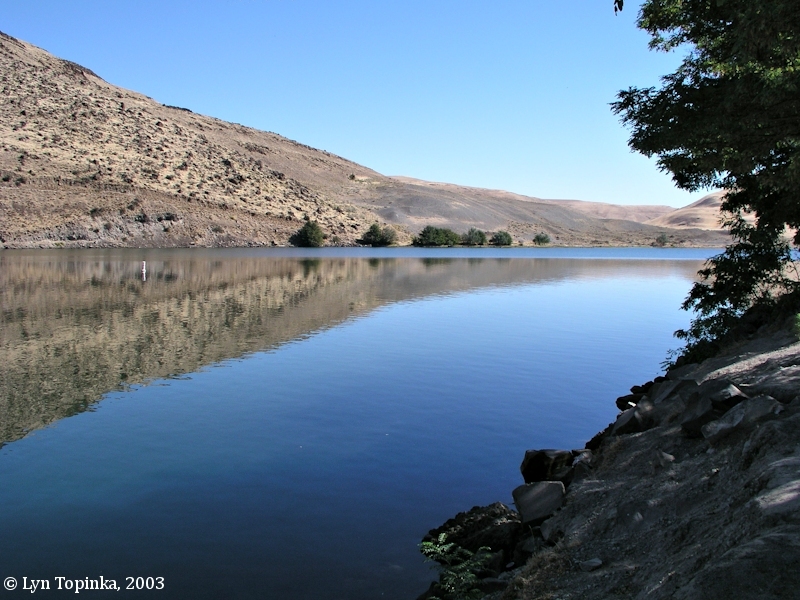 On April 22, 1806, Lewis and Clark camped on the Washington State side of the Columbia River, just upstream of the John Day Dam, and nearly across from the mouth of the John Day River. The John Day River is just visible above the dam. Image taken June 6, 2012. LePage Park is located on the left bank of the John Day River at the confluence of the John Day and the Columbia. Lewis and Clark called the John Day River the "River La Page", after Corps of Discovery member, Jean Baptiste Lepage, a French trapper who joined the Lewis and Clark expedition at the Mandan villages. 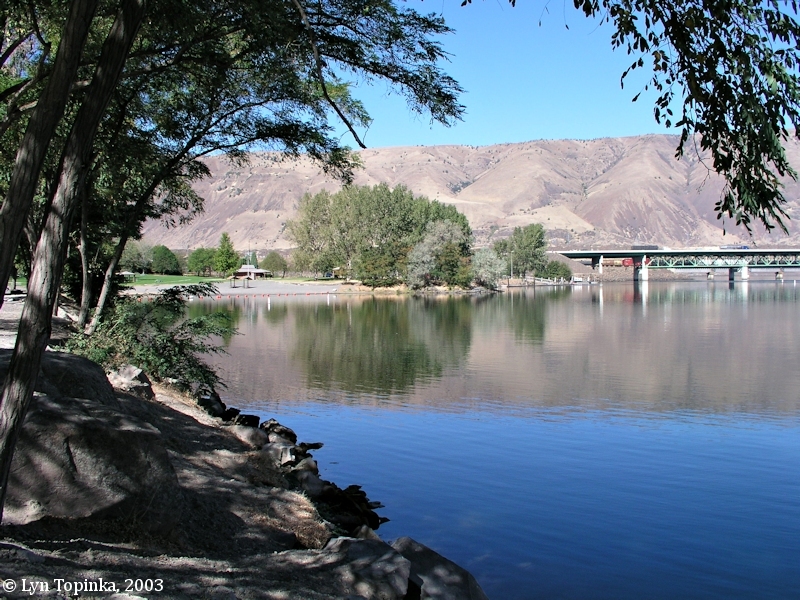 Click image to enlarge John Day River, Oregon, and LePage Park. Image taken September 26, 2003. Alkali Canyon extends south from Arlington, Oregon and then heads west to Rock Creek, a tributary of the John Day River. Flood waters of Lake Condon of the Missoula Floods spilled over the southern bank of the Columbia River and headed south through Alkali Canyon to Rock Creek to the John Day River and then the John Day River drainage back to the Columbia River. "Hodge (1931) recognized more than 50 years ago that floodwaters had overtopped the low divides between the Columbia River and the headwaters of Rock Creek, as well as the divide directly into the John Day Canyon. The floodwater poured up Alkali Canyon, south of Arlington (Oregon 19), and scoured a channel westward (now occupied by the Union Pacific RR branch line) into Rock Creek 6 miles above its junction with the John Day River. Farther west, the Floods poured up Jones Canyon, Blalock Canyon, and Phillip Canyon just east of Quinton, where it formed several square miles of scabland and left a high-perched expansion bar on the east wall of the John Day Canyon 10 miles from its mouth. A sixth small spillway lies at 1020 feet elevation, 2 miles northwest of Phillipi Canyon." Source: John Eliot Allen and Marjorie Burns, with Sam C. Sargent, 1986, Cataclysms on the Columbia: Timber Press, Portland, Oregon.